It may not be the typical man-show, but my husband is a huge Glee fanatic. 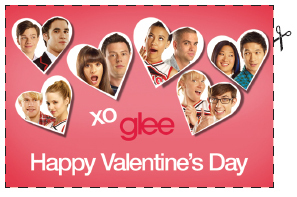 So, just for him (and others who share his enthusiasm), I am sharing these Glee-inspired printable Valentine's. If you are or have a Glee fan in your house, I suggest printing the last page, which will give you 8 cards on one page. Free printable cards are a frugal alternative to store bought cards for sure. You can also click here to get the Toy Story printables that we chose for school ourselves this year!